In songs from my analogue utopia I explore the self-organizing coordination dynamics of analog oscillators and the Utopian potentials of analogue communication. In analogue communication synchronization results from the mutual interaction of two or more processes, not a single process is dominating the other. It is in the mutuality and in the degrees of freedom of each participating process where I see the Utopian potential of analogue communication. I undertake this exploration on the screen of an overhead projector where I place little motors driven by analogue oscillators. 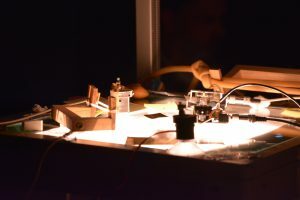 The motors hit on rubber bands that are equipped with piezo-pickups, rendering the rhythmical hitting of the motors into sound and shadow play. In songs from my analogue utopia I explore the self-organizing coordination dynamics of analog oscillators and the Utopian potentials of analogue communication. In analogue communication synchronization and coordination appear as an emergent effects and are not codified (Faubel 2016). In analogue communication synchronization results from the mutual interaction of two or more processes, not a single process is dominating the other. It is in the mutuality and in the degrees of freedom of each participating process where I see the Utopian potential of analogue communication. These emergent effects are similar to coordination patterns observed in nature such as the synchronization of fireflies or the synchronization of people when clapping their hands. Because synchronization results from the mutual interaction of two or more processes, not a single process is dominating the other. It is in the mutuality and in the degrees of freedom of each participating process where I see the Utopian potential of analogue communication. Through the construction of simple analog oscillators that are put in communication by setting up networks of them, the concepts of emergent synchronization and coordination become tangible and can be experienced. Each analog oscillator is connected to a motor that renders the oscillation into a tapping movement. The motors tap rubber strings and the tapping is made audible with contact microphones. The specific rhythm of each oscillator becomes audible, synchronization and coordination between one ore more oscillator is quickly detected by the human ear. 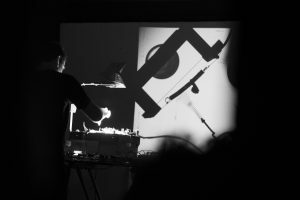 But not only the ear is involved, the rhythmical patterns are also visualized as a shadow play by placing the motors on the screen of an overhead projector (Figure 1). During the performance I play with the coupling between the oscillators, with the internal parameters of each oscillator and with the environment, with the spatial configuration of the rubber strings and with the materiality of the rubber strings. It is another intriguing quality of analogue processes that they incorporate an openness to the external world. The motors that are connected to the analogue oscillator do not simply render the internal oscillation visible, but instead they are continuously modifying the oscillatory pattern, be- cause they feed back into the analogue circuit. Rather than just hitting rubber bands the motors and the analogue oscillators are in a continuous dialogue with the world (Faubel 2014). As matter of fact changing the physical properties of ,for example the legs, has an effect on the rhythmical pattern that is produced and also on the sound picked-up by the microphones. 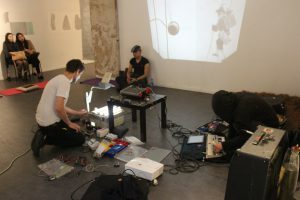 During the performance I build a more and more complex network of oscillators, Through changing the rubber band configuration and by changing the amount of information exchange between the oscillators a score emerges.